CAF Appoints DR Congo Ref Ngambo For Super Eagles – Royal Times of Nigeria. 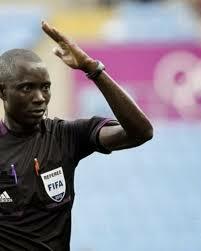 CAF has named Democratic Republic of Congo’s Jean Jacques Ndala Ngambo as the centre referee for Super Eagles 2019 African Cup of Nations Group E clash against Libya. The crucial encounter is billed for the Ahmadu Bello Stadium, Kaduna on October 12. Meanwhile, CAF has also announced that Joshua Bondo of Botswana will the man in the centre for the return leg fixture against the Mediterranean Knights at a yet to be named venue in Tunisia on October 15. Bondo was in charge when the Super Eagles defeated Zambia 1-0 in a Russia 2018 World Cup qualifying fixture in Uyo lat year. Libya sit at the top of Group E with four points from two games, while the Super Eagles occupy third position with three points behind South Africa who have four points. Seychelles are at the bottom without any point.